This recipes for roasted nuts takes about 20 minutes to make from start to finish and will give you a good healthy snack on a cold winter day or night. You can play with the ingredients to make a sweet n spicy or just a spicy taste on your snack. The type of nut also depends on your preference. Personally I like walnuts, pecans and peanuts since they can be bought in bulk untreated with salt or flavoring and are not that expensive. Left over nuts of any kind can be stored in either the freezer or refrigerator to keep them fresh. 1:Preheat the oven to 425 degrees. 2:Crack or shell a selection of nuts. If the nuts have skins, remove those as well. 3:Spray the baking sheet with non-stick spray. 4:Toss the nuts in the vegetable oil to make sure they are lightly coated. You will need 2 tbsp. of vegetable oil for every cup of nuts you are roasting. 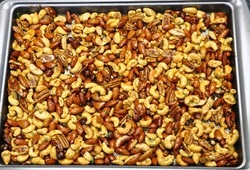 5:Spread the nuts on the baking sheet and sprinkle with salt to taste. 6:Roast the nuts in the oven for 5 to 10 minutes, but be careful not to over roast them. Because they have a high oil content, they will continue to cook internally even after they are removed from the oven. You'll know they are done when the nuts become fragrant and are lightly brown. For a variation on this recipe to make sweet or candied nuts simply add 1/4 cup of brown sugar, honey or even cinnamon sugar to each cup nuts before roasting and mix well.